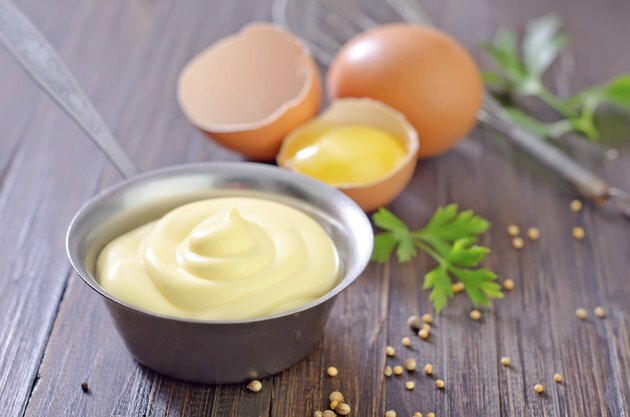 It's no secret that mayonnaise and butter deliciously enhance the flavor of many foods. However, regular mayonnaise and butter both contain saturated fat, the type of fat derived from animal sources. Eating a diet containing more than 10 grams of saturated fat daily may lead to an increased risk of cardiovascular disease and type 2 diabetes, according to the 2010 Dietary Guidelines for Americans. Use mayonnaise and butter sparingly, adding them to your diet as an occasional indulgence and not as an everyday staple. As far as calories go, regular mayonnaise -- or mayo -- and butter stack up fairly evenly. There are 90 calories in 1 tablespoon of Hellman's regular mayo and 102 calories in 1 tablespoon of regular butter, according to the website My Fitness Pal. Reduced calorie olive oil mayo contains 45 calories per tablespoon and the LIVESTRONG.com MyPlate states that light butter has 50 calories per tablespoon. Kraft fat-free mayo has only 10 calories in 1 tablespoon. Remember to account for the additional calorie and other nutrition values if you use more than 1 tablespoon of mayo or butter. You need small amounts of fat in your diet to provide energy and aid the absorption of vitamins. However, fat is rich in calories and saturated fat can increase your risk of some health problems, giving you another reason to go lightly on the mayo and butter. Hellman's regular mayo has 10 grams of total fat with 2 grams of saturated fat in 1 tablespoon, and regular butter contains even more, with 12 grams of total fat and 7 grams of saturated fat in 1 tablespoon. To help keep your daily fat intake under control, choose reduced fat or fat-free mayo with no saturated fat, and light butter with 4 grams of saturated fat per tablespoon. Keep track of the amount of cholesterol that you ingest because your body manufactures most of what you need. The 2010 Dietary Guidelines for Americans advises getting no more than 300 milligrams of cholesterol from your diet each day. Mayo contains less cholesterol than regular butter. There are 5 milligrams of cholesterol in 1 tablespoon of Hellman's regular mayo, 4 milligrams in 1 tablespoon of reduced fat olive oil mayo and no cholesterol in Kraft fat-free mayo. Each tablespoon of regular butter contains 31 milligrams of cholesterol, but light butter has no cholesterol. Mayo and butter both contain sodium, a nutrient required to maintain proper fluid balance and blood pressure. According to the 2010 Dietary Guidelines for Americans, you should restrict your sodium intake to 1,500 to 2,300 milligrams daily because too much sodium in your diet can lead to high blood pressure and water retention. Mayo is a bit higher in sodium than butter. Hellman's regular mayo contains 90 milligrams of sodium in 1 tablespoon and the same amount of regular butter has 82 milligrams. Reduced fat mayo with olive oil has 95 milligrams in 1 tablespoon and light butter contains 70 milligrams in each tablespoon. Although it's lower in fat and calories, Kraft fat-free mayo is higher in sodium, with 120 milligrams in 1 tablespoon.